Writer Kelly Thompson and artist Mattia De Iulis launch the new Marvel Digital Original today! Three chances, three giant-sized issues, one sardonic Private Investigator. A new era begins. After an unresolved case comes back to haunt her—and all the powerful women of New York—things are about to get personal for Jessica Jones. In an attempt to right her wrongs and bring a killer to justice before she loses the life she never thought she’d be lucky enough to have, Jessica starts a brand new investigation with three double-sized Marvel Digital Original issues to kick off her new ongoing series—beginning today! Read JESSICA JONES #1, by writer Kelly Thompson and artist Mattia De lulis, right now. None know this better than series writer Kelly Thompson. She’s studied Jessica’s every move, every thought, and even interrogated the character’s creators in preparation to grab the torch and run alongside new antihero artist Mattia De lulis. The writer explains that while Killgrave may be gone, Jessica’s newfound serenity reminds us what she has to lose. And it seems Thompson is determined to push Jessica to her extremes to show just what she’s made of—and what lengths she’ll go to in order to save her new life and family. Join Kelly Thompson and Mattia De lulis for the Marvel Digital Original issue JESSICA JONES #1, out today! And prepare for issues #2 on August 29 and #3 on September 26. 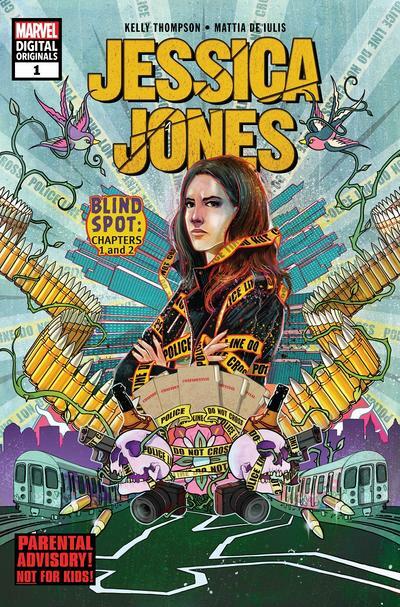 The first arc, JESSICA JONES: BLIND SPOT, will also be available on October 31 in print as graphic novels in comic shops and wherever books are sold. And then the ongoing continues!